A professor stood before his philosophy class and had some items in front of him. When the class began, wordlessly, he picked up a very large and empty mayonnaise jar and proceeded to fill it with golf balls. He then asked the students if the jar was full. They agreed that it was. The professor then picked up a box of pebbles and poured them into the jar. He shook the jar lightly. The pebbles rolled into the open areas between the golf balls. He then asked the students again if the jar was full. They agreed it was. The professor next picked up a box of sand and poured it into the jar. Of course, the sand filled up everything else. He asked once more if the jar was full. The students responded with an unanimous "yes." The professor then produced two cups of coffee from under the table And poured the entire contents into the jar, effectively filling the Empty space between the sand. The students laughed. "Now," said the professor, as the laughter subsided, "I want you to recognize that this jar represents your life. The golf balls are the important things - God, family, children, health, friends, and Favorite passions -- things that if everything else was lost and only they remained, your life would still be full. The pebbles are the other things that matter like your job, house, and car. The sand is everything else -- the small stuff. 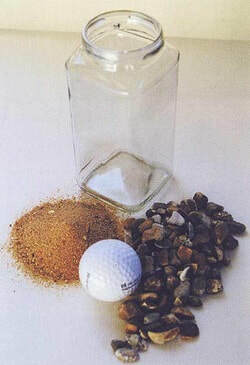 "If you put the sand into the jar first," he continued, "there is no room for the pebbles or the golf balls. The same goes for life. If you spend all your time and energy on the small stuff, you will never have room for the things that are important to you. So... Pay attention to the things that are critical to your happiness. Play With your children. Take time to get medical checkups. Take your partner out to dinner. Play another 18. There will always be time to clean the house and fix the disposal. "Take care of the golf balls first -- the things that really matter. Set your priorities. The rest is just sand." One of the students raised her hand and inquired what the coffee represented. The professor smiled. "I'm glad you asked". It just goes to show you that no matter how full your life may seem, there's always room for a couple of cups of coffee with a friend." to him, and the other the LORD. at the very lowest and saddest times in his life. This is something to make you go...hmmm...where is my Bible?